Veils were originally created as protection to the bride from evil spirits lurking on her special today. Today the veil is more of a bridal accessory than a protector of evil, but it doesn’t make choosing the perfect veil any easier. When you are searching for the perfect veil it can be almost as difficult as finding the perfect wedding dress. Once you have finally found the veil and exhale in relief that you have found ‘it’, it is time to decide on the perfect hairstyle that compliments the style. A lot of brides choose to grow their hair long or get extensions for their big day so here are 5 great long hairstyle ideas that work well with veils. It is very traditional for a bride to wear her hair in a curled bun near the crown of her hair. Although this look is traditional and beautiful the high slick-backed topknot is a fashionable and modern alternative. This style is perfect bridal hair because it shows off all of your jewellery and the dress while keeping the hair chic but simple. The style works well with all types from dresses from strapless to a high-collared cut. The type of veil this works with is a wispy and multilayered flyaway or elbow veil. The top knot is top fashion and simply wedding-chic. The birdcage veil is simple, elegant, and vintage and who wouldn’t want their veil to send the message of timeless elegance? There are plenty of ways to wear a birdcage veil with long locks but one of the best options if a low side bun. You have to choose if you want the bun on the side of the veil or the opposite. This can bed determined by personal preference, the dress cut, and also the style of the birdcage veil. Keep your side bun loose with strands out framing the face. A bird cage veil looks stunning with a low side bun. If your dress is bohemian beautiful then your veil and hair should have the same look. The bohemian style is flirty and playful so your hair and veil should have the same laid-back appeal. A great way to show off your relaxed or avant-garde style is by leaving your long hair down and styling it with simple loose waves. A great tip is to add a side braid, a crown braid, or a barely there headband. 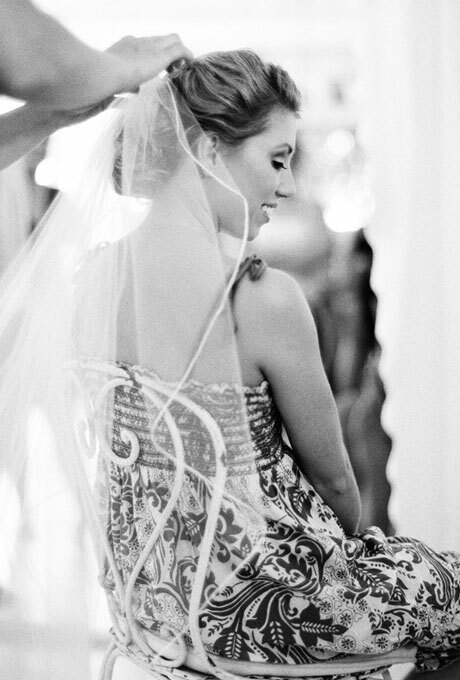 When it comes to the veil with your loose locks opt for a fingertip, sweep, chapel, or even cathedral length veil. The long veil will look simply gorgeous with your long hair. Style the veil with flowers that match your bouquet. 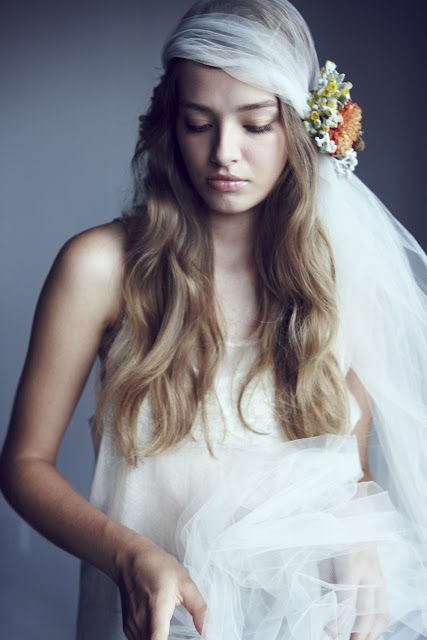 If you are looking for a simple alternative to a traditional veil then try a bohemian look with flowers. If you have chosen a long gorgeous multi-layered cascading veil then you might need the perfect hairstyle for setting the veil, and the braided chignon offers veil practicality and beauty. The braided chignon makes it easy to pin other hair accessories such as barrettes and flowers. Keep the chignon at the nape of the neck or slightly higher for a softer look. This elegant chignon is a great hairstyle for setting a veil. Perhaps you remember Kate Middleton’s dramatic long gown styled with loose soft waves. This look is traditional and beautiful but yours doesn’t have to be so royal. Style this look with big loose curls and a dramatic side part. We love the big loose waves because they are a modern take on the traditional wedding curls and best of all; they look gorgeous with every type of veil. You can wear a frontier birdcage veil or a multi layered fingertip veil. 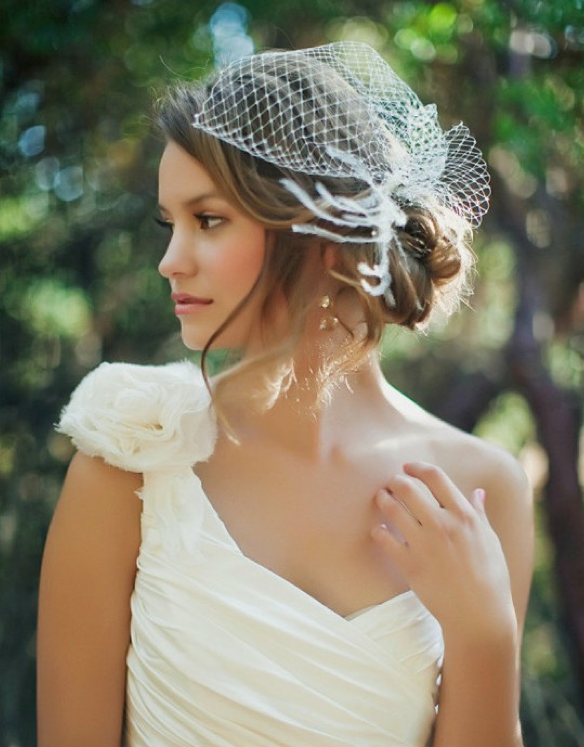 Whichever you choose you can’t go wrong with this simply gorgeous hairstyle and veil. 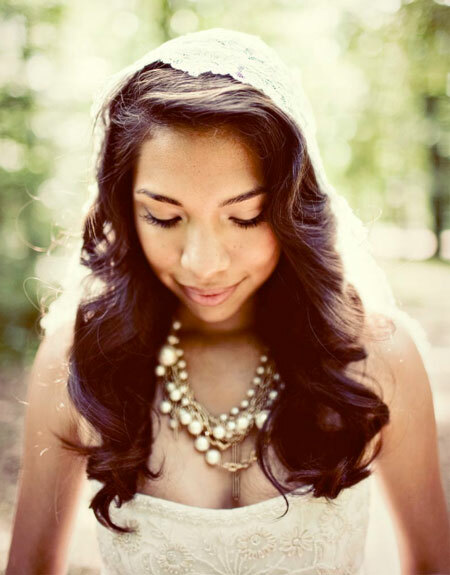 Big soft waves are a gorgeous hairstyle for any veil.